By mid-afternoon I had had a couple of missed calls from Liberal by-election candidate and fellow Leadership Wood Buffalo alum, Kyle Harrietha. We finally connected. "Can't you keep a secret?" he asked. 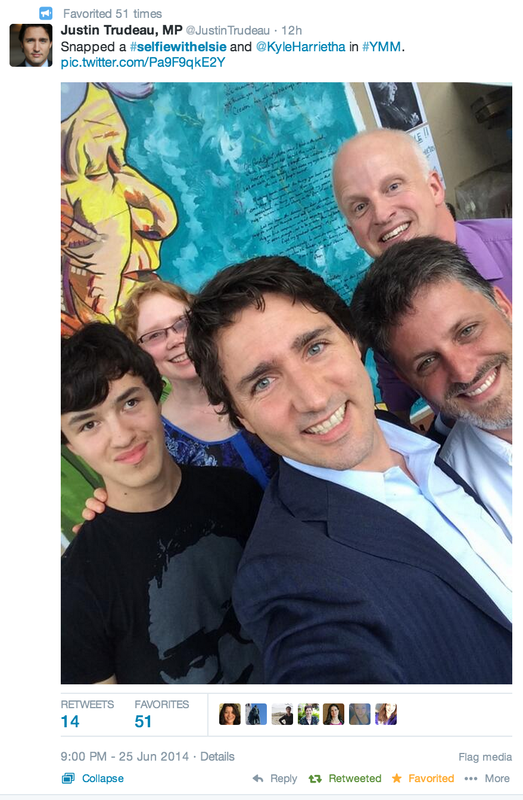 "Justin Trudeau is going to come by your place to get his #selfiewithelsie." Sometimes, it doesn't hurt to ask, to put things out into the universe. That's how crazy and unlikely things happen. Mr. Trudeau, the leader of the Liberal Party of Canada, and possibly the next Prime Minister, pulled up to our house in an unassuming white rental car with Adam Scotti, his photographer and a driver. Kyle had arrived a few minutes earlier in his own car. We walked around to the back, giving him the whirlwind tour of Heather's beautiful garden and the murals of Bill Clinton and Woody Allen that I had done years ago, before opening up the gate, leading him into the back alley and to an unobstructed view of the mural portrait of 96-year-old Métis elder Elsie Yanik. I pointed out the prayers that had been integrated into the piece, words that Elsie had spoken as blessings at multiple major community events and gatherings. He went up close and started reading. "I know this one," he said. "I read this at my brother's funeral." Michel Trudeau died in 1998, killed in an avalanche while skiing at Kokanee Glacier Provincial Park. He was 23 years old. On what would have been his 37th birthday, his brother Justin announced his bid to run for the leadership of the Liberal Party. In the short time that he was with us, I was able to tell him the story of the painting, the tagging that it covered up, the incredible leadership of Elsie, and how Ben found the wood for the prayer bench along the shore of the Athabasca River. What is both remarkable and wonderful, is that this spontaneous appreciation of grassroots public art and a revered elder in our community happened with no fanfare, paparazzi, or security. 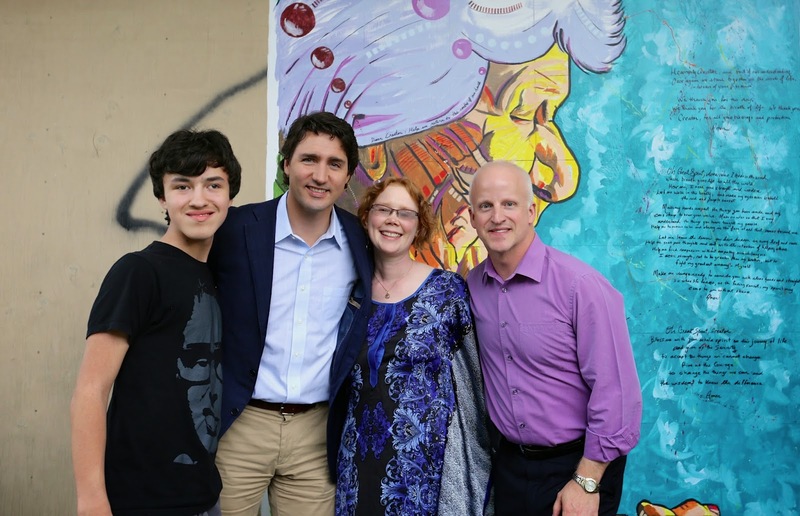 Mr. Trudeau freely and easily visits our community, goes door knocking with Kyle, and makes the decisions to do things that matter to him and to others. 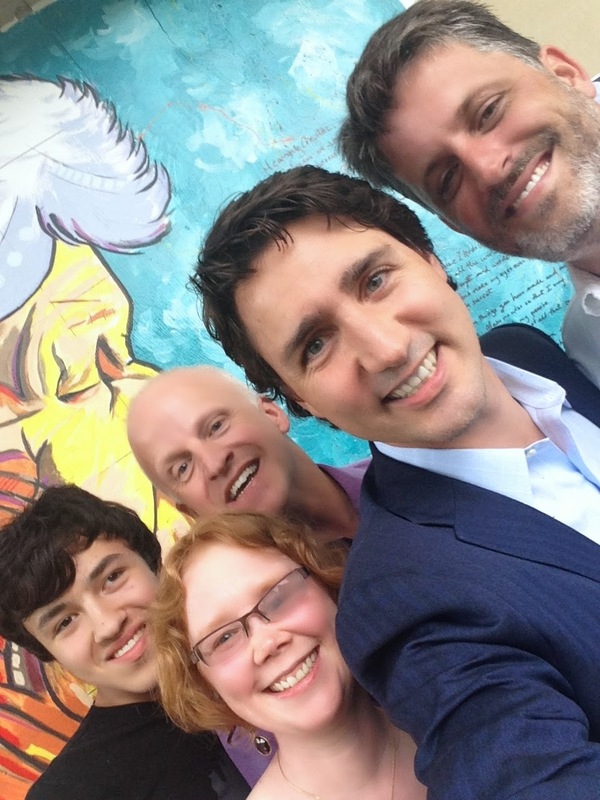 As we approach the beginning of July and our country's birthday, there is no better time to point out that yesterday's brief encounter with Mr. Trudeau was so quintessentially Canadian. For our American friends, it would be akin to Mr. Obama having dropped by for a random visit in the summer of 2007 as he was beginning his ascendency, no security detail, no press. Heather and I walked over to Mrs. Yanik's apartment, first, to return the book of prayers she had let me use and second, to let her know that Mr. Trudeau had been by to see her painting. She was so pleased to hear about the visit and share some time with us. "This fills me with so much peace," she said. "The next time you come I'm going to make tea and some fresh bannock." I did a test to see the penetration of the #selfiewithelsie hashtag in the social media universe. As of this morning, and largely thanks to Mr. Trudeau's tweet, it has left 828,471 impressions and reached 363,114 different accounts. If Elsie was famous before, she is even more famous now!